This is a feature piece written for OUT magazine. Sat in the evening sun Shaun shifts closer to Paul as the temperature drops in the fading light. I meet the couple sat on a beach in Tel Aviv, Israel. The two men in their mid thirties are on a couple of weeks vacation from their home in south London. I ask them if it is OK to talk to them about the gay scene in Israel and they happily suggest going for beer in the bar a hundred meters away on the beach front. Sweet smelling smoke fills the air inside the bar as hookah pipes are shared between friends. We are sat with panoramic views of the now silhouetted beach front. Passing the hookah pipe across the table to where the two men are sat side by side I start the interview by asking them why they chose Tel Aviv for their holiday. Paul exhales a plume of smoke, takes a sip from his beer and jokes, “cheap easy jet flights”. Shaun laughs and adds, “I just love the rub down at the [Ben Gurion] airport” (referring to the notoriously inhospitable welcoming foreigners receive at the airport). With a smile I try a less subtle approach and asked if it had anything to do with the internationally renowned LGBT scene in Tel Aviv. Paul does not hesitate this time and comments, “We want to holiday somewhere that we feel relaxed and welcome. 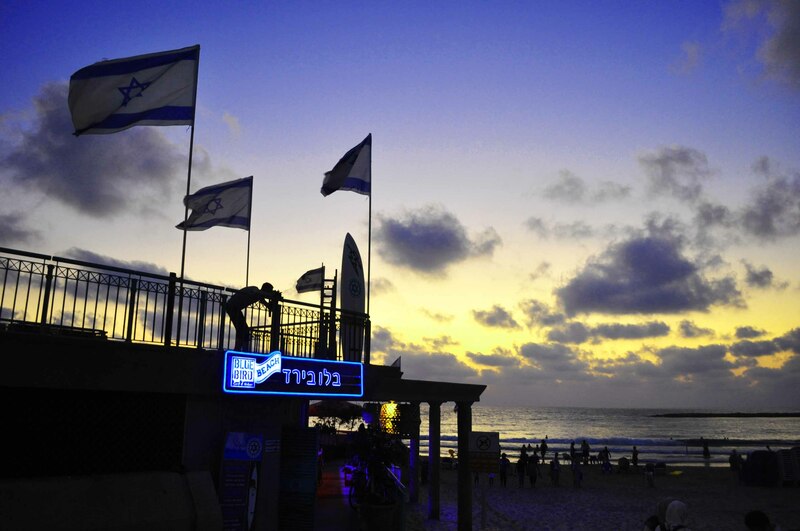 A friend of mine told me about Tel Aviv and so we thought we would check it out”. As an afterthought, as if recalling a distant memory, he adds, “everything is set up for us here”. Tel Aviv is a well known destination for ‘gay tourism’. Last year Tel Aviv launched a $90 million campaign to present itself as, “an international gay vacation destination.” Leon Avigad, owner of the gay-friendly Brown hotel, explains the city’s popularity, “We are cosmopolitan, we’re very Western, European and American but on the other hand we’re very much into the Middle Eastern warmth and welcoming, and this combination attracts”. Our visit to Tel Aviv coincide with the holiday of Pesach (Passover), the celebration of the story in Exodus where the ancient Israelites were freed from slavery in Egypt. As such it is very difficult to buy certain things such as beers and certain breads. I ask Shaun if this has been a problem and he responds with more depth than I was perhaps expecting. “I think it is beautiful that this society can hold onto its traditions and religious celebrations and still be so open minded”. I wondered how much Shaun had ventured much beyond the city since being here. On cue, they ask me what I am doing in Tel Aviv and I tell them all about EAPPI and they seem genuinely interested. I ask them if they have ever been to the occupied Palestinian territories. Paul responds with a degree of defensiveness in his voice that he assumed he wasn’t allowed, “I thought there was a war there”. I explain to them, the best I can, the problems caused by the occupation and what I have experienced since living there. I elaborate my point about why I think it is bad for both Israelis and Palestinians. There is a more than awkward silence and I begin to worry that I might have pushed the conversation both metaphorically and literally too far from Tel Aviv. As if reading my mind Paul comments, “all of that seems a long way from here”. I take this opportunity to try and relate what is happening in the conflict to their experiences here in Tel Aviv and ask if either of them have ever heard of the phrase, “pinkwash”. They respond in unison, “no”. I try my best to offer a definition of Pinkwash – the idea that Israel has created a deliberate strategy to conceal their continuing violations of Palestinians’ human rights behind an image of modernity, illustrated through the booming gay scene. Both men looked troubled at the idea, clearly concerned that “their community” and “their choices” could somehow be linked to the troubles I had just described about the military occupation. I try to reassure my two new friends and joke with them that they are not responsible for Israel’s occupation. For Paul however this was not enough. Playing with the beer mat in front of him he almost apologetically comments, “I guess we have only seen a part of life here”. I smile and again try to reassure them both that they are meant to be on holiday relaxing, not peacekeeping. They sheepishly smile back. For many in the LGBT community it is an ethical dilemma whether or not to boycott Israel as a holiday destination. On one hand it is a beacon of LGBT rights in an otherwise very hostile environment. Some Palestinian activists have tried to persuade me that there is a growing gay rights movement in Palestine. If there is I have yet to stumble across it. Netanyahu told Congress last May that the Middle East was “a region where women are stoned, gays are hanged, and Christians are persecuted.” Sadly, this rhetoric may be alarmist but has also an element of truth in it. On the other hand however Israel is accused by Amnesty International of “ill-treatment and torture of detainees, excessive use of force, the detention of conscientious objectors, and forced evictions and home demolitions” as well as having a “disregard for international law”. For anyone within the LGBT community who is concerned about equal rights and equality there are some clear moral concerns here. As an LGBT activist who fundamentally believes in an equality of rights, I cannot settle on Israel having a progressive attitude towards LGBT rights whilst routinely violating other rights through the conflict and occupation. As Haneen Maikay, the director of Al Qaws (a Palestinian gay rights group) recently said in the New York Times, “When you go through a checkpoint it does not matter what the sexuality of the soldier is”. The LGBT community are not separate from the rest of society who suffer from the occupation. We are now three beers into the conversation and Shaun’s tongue as well as his sense of moral outrage has been loosened, “So what can we do to highlight all this. It’s f***ed up that people can come here and are not told about any of this s***”. Partly through tiredness I decide to avoid the minefield of BDS (boycott disinvestment and sanctions) and instead simply comment that I think it is important to make sure that everyone who comes to Tel Aviv is aware of what is happening just 20 kilometres to the east. Paul however looks concerned. I have been talking for the last ten minutes and Paul has not spoken. “I don’t know” he says between regular slugs of beer. “there are so many f***ed up countries in the world where you can get hung for just glancing at another guy. It doesn’t feel right to be criticising a country who are opening their arms and welcoming us”. This concern reflects a very real issue within the LGBT community. To criticise Israel is to break an unspoken pact where those working on LGBT issues stand united in their struggle. The answer to this dilemma presented itself to me in Yad Veshem, the Israeli holocaust museum. Here they have on the wall in large letters the poignant words of Martin Niemöller “First they came for the communists, and I didn’t speak out because I wasn’t a communist. Then they came for the trade unionists, and I didn’t speak out because I wasn’t a trade unionist. Then they came for the Jews, and I didn’t speak out because I wasn’t a Jew. Then they came for me and there was no one left to speak out for me”. If the 20th century taught us anything it is that silence can allow terrible things to happen. The LGBT community cannot stay silent while Israel uses its progressive attitude towards LGBT tourism to deflect attention from the continual violations of basic human rights standards in the occupied territories. Equally however, I believe we have to welcome Israel’s pioneering approach towards LGBT tourism, and encourage these attitudes to spread to less hospitable parts of Israeli society. Stood outside the bar, the air is now cold and so our good-byes are short. As the two men turn to leave Paul says to me that “next time we come, I think we should spend a few nights somewhere in the West Bank”. I smile and say that they definitely should. Parts of Israeli society may be a beacon for LGBT rights in the middle east, but it is also an occupier of another land. To understand Israel, I think you have to visit that other land. Nice article Steve. I also think it is important not consider that Tel Aviv’s reality for the LGBT community is quite different than other places in Israel. Jerusalem, religious settlements, kibuts and army, just to mention some examples, are very hostile. I strongly recomend the movie Eyes Wide Open (http://www.youtube.com/watch?v=rwBaS6m3q5c) about this matter. Excellent article. I am reading this post in Johannesburg airport – on the way to Zambia. In many ways it reminds me of some of the arguments used years ago by pro-apartheid South Africans – promoting apartheid South Africa as a beacon of modernity and democracy, while ignoring the repression and suffering of the Black population in the so-called homelands and the apartheid sponsored wars in the neighbouring countries. Human rights are in-divisible – whether for Palestinians in the occupied teritories or for Lesbian and Gays in many arab states. We must not pretend not to notice.Thank you for reminding us. This is a very, VERY, good article. Great Steve – See you in June. David Heap. Fantastic work bringing this aspect in, Steve.